This page shows photographs of the of the progress of the Great Central Railway ‘Bridging the Gap’ project in Loughborough - restoring the rail link between the north of the GCR and the south of the GCR(N), that was removed in the 1980s (see the Old Photographs Section). The construction of a bridge over the Midland Main Line at Loughborough - Now completed. Reconditioning the original bridge over the canal - Work started. Rebuilding several hundred metres of embankment. Relaying track and installing signalling. The intention is to update this page as work on the project progresses. The first, and the major, civil engineering task of the project was the construction of the bridge over the Midland Main Line, which is now completed save for the final blue facing bricks. 9/4/17. 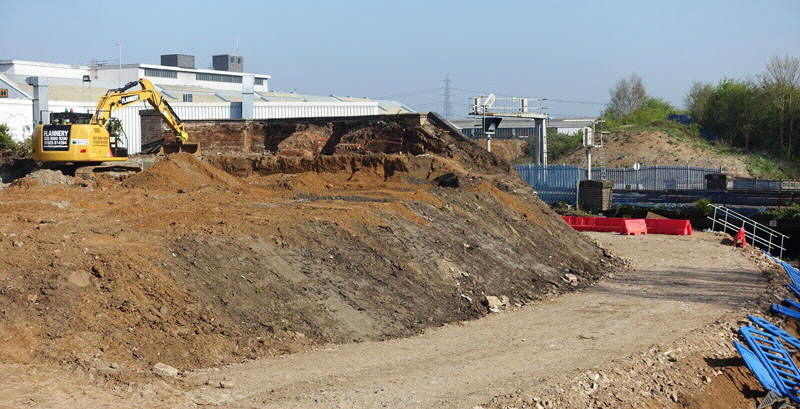 Work has started next to Preci-Spark, on the south side of the Midland Main Line, with the original embankment being reduced in height. On the right is the Hermitage Brook. 9/4/17. Reducing the embankment has revealed the method of construction of the original GCR bridge abutment. The embankment on the north side can be seen beyond the fence to the right of the signals, 9/4/17. 16/4/17. On the south side of the Midland Mainline the old embankment has been greatly reduced, but still a couple of feet high has been left and is being covered with chippings. Most of the old abutment will be retained. Passing is 66019 with a northbound Network Rail works train. 16/4/17. A piling auger has arrived and is positioned on the north side of the Midland Mainline ready to bore the holes for the piling. 16/4/17. Nearby, steel reinforcing assemblies for the concrete piles are being built up. 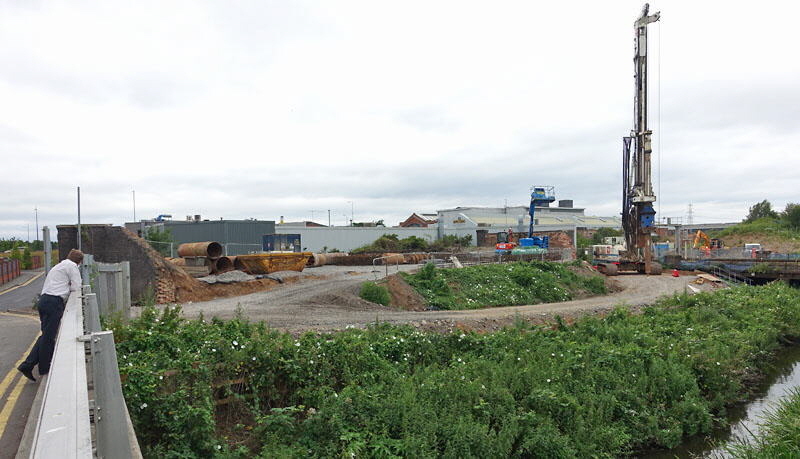 The original pile boring machine left soon after the last report on 16/4/17, and there was little change from then until a new pile boring machine arrived on 26/5/17. 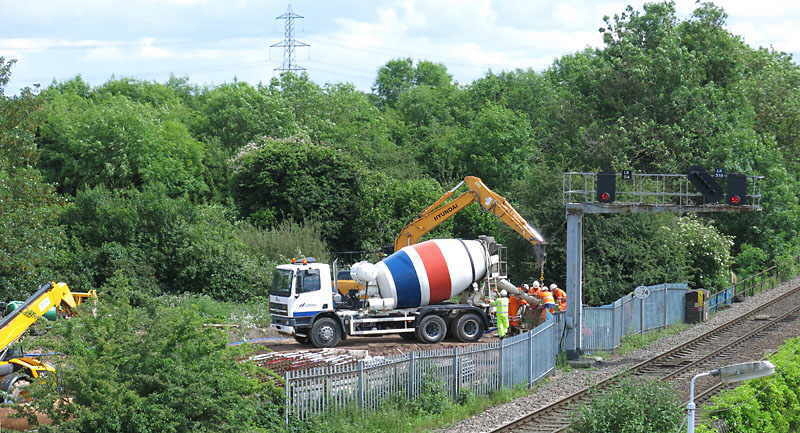 This larger machine is required because of the higher than expected water table, though this has increased the cost of the project — see http://www.gcrailway.co.uk/unify/. So work should restart soon. 28/5/17. 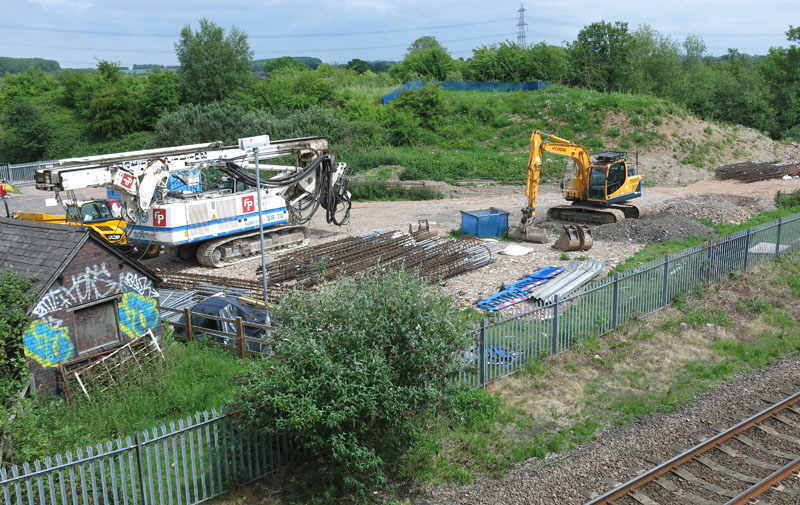 The larger pile boring machine stands on the left inside the work compound on the north side of the Midland Mainline. 9/6/17. 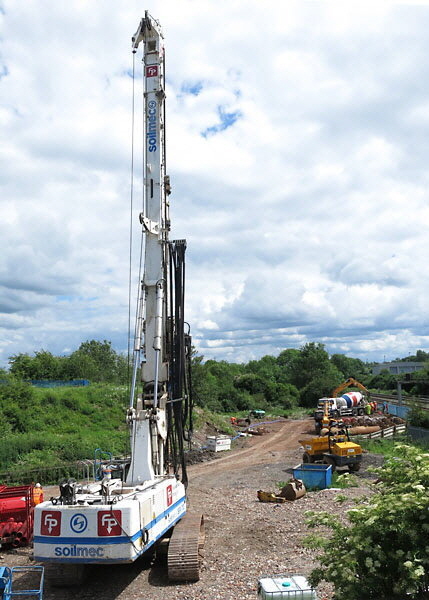 The pile boring machine stands back while concrete is poured into a hole that it has bored next to the north side of the Midland Main Line. 9/6/17. Concrete being poured into a pile hole next to the north side of the Midland Main Line. 23/6/17. 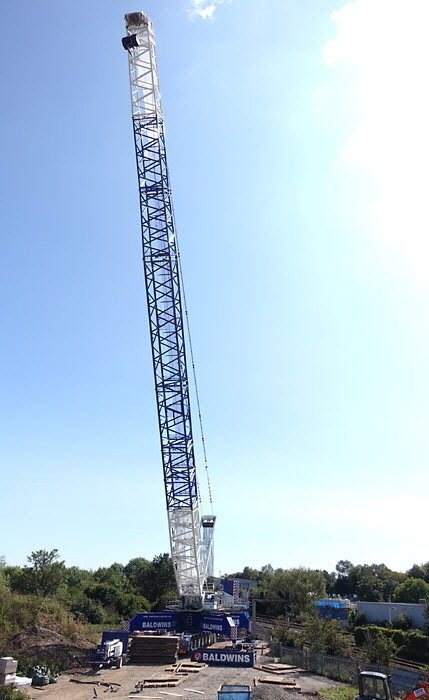 After completing some of the piles on the north side, the pile boring machine was moved overnight to the south side. 6/8/17. 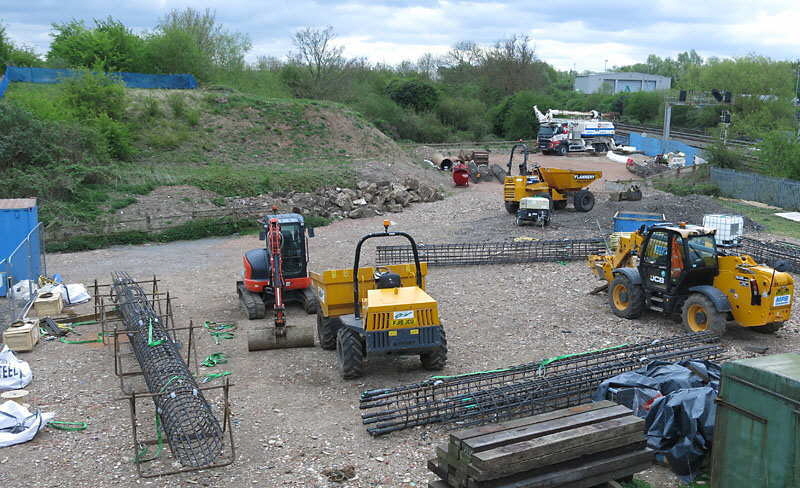 Abutments are being built by forming walls from concrete sections around the piles, inserting reinforcing bars and then filling with ready-mix concrete. On the south side the new abutment is situated between the old GCR brick abutment and the Midland Main Line. 6/8/17. 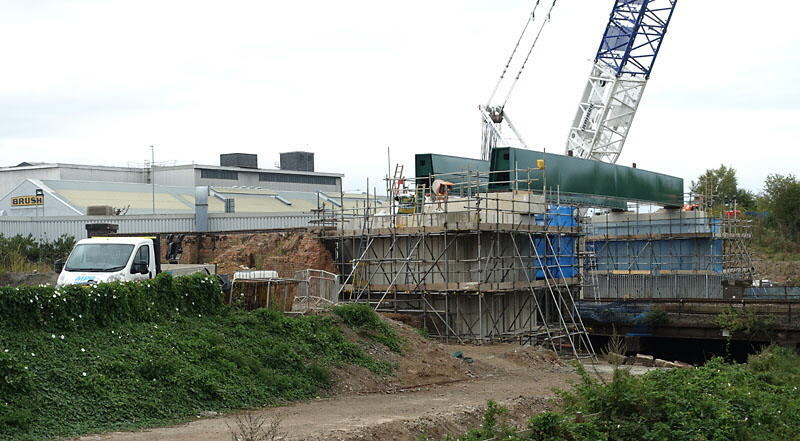 The bridge abutments are progressing where the piles were inserted. 10/8/17. Steel structures are being erected on the concrete foundations of the abutments. 27/8/17. An enormous Liebherr LG 1750 crane has been used to put the abutment cappings in place and will be used to place the bridge into position. 27/8/17. 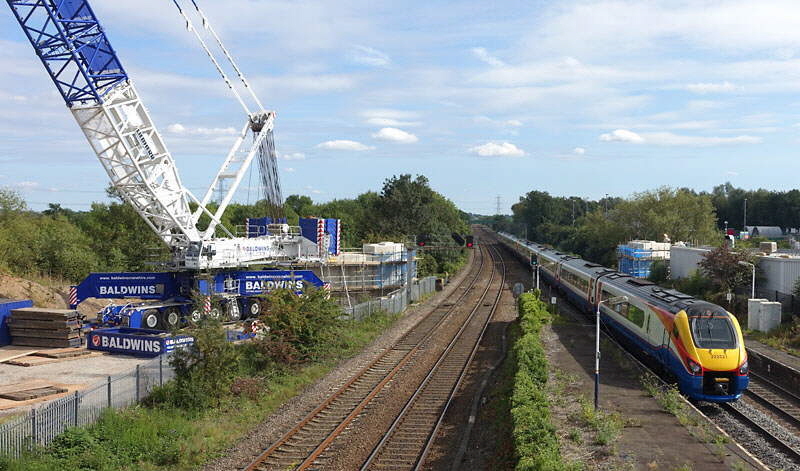 A Meridian on a Nottingham to St. Pancras service passes the gap, which is about ready to take the new bridge, and the Liebherr LG 1750 crane that has been used to put the abutment cappings in place and will be used to place the bridge into position. 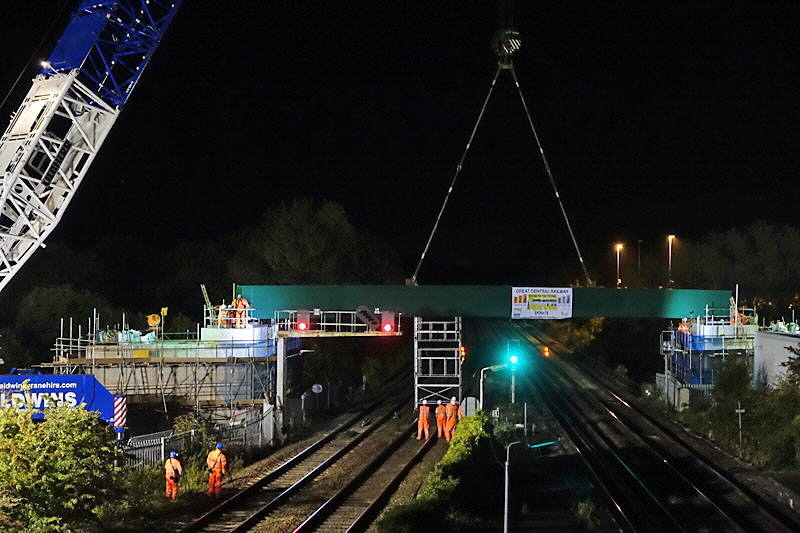 3/9/17 The side beams of the new bridge were delivered and installed in the early hours of Sunday 3rd September 2017. 3/9/17, 02:05am. The steel ropes are attached to the first side beam of the bridge after delivery by lorry. A Great Central Railway “Bridge to the Future” banner has also been attached. 3/9/17, 02:15am. 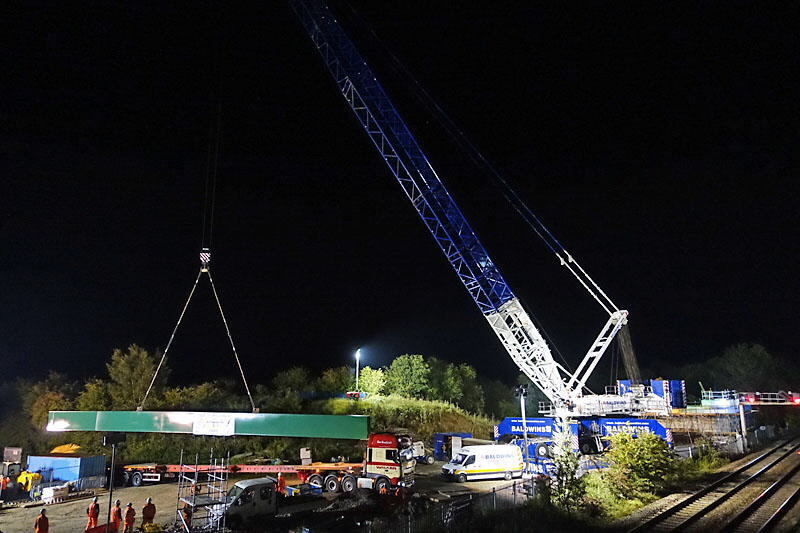 The first side beam of the bridge is slowly lifted off the lorry, with perfect weather for the operation; dry and with little breeze. 3/9/17. The first side beam of the bridge (the west side) is gently lowered into position on the abutments. 3/9/17. The west side beam of the bridge is fixed to the abutments, about 37 years after the original bridge was removed. 3/9/17. Later that day, an Intercity 125 on the 1F39, 13:55, St Pancras International to Sheffield passes under this new feature over the the Midland Main Line. The banner that was in place during installation has been removed. 3/9/17. From the south side of the Midland Main Line the box-section construction of the side beams can be easily seen. The deck is to be fitted later. It is readily apparent that the new bridge has been slewed slightly to the east of the original embankment here (the end wall of which can be seen to the left behind the white vehicle), to give room around Preci-Spark. February 2018. On the south side Preci-Spark have had their car park reinstated. It is likely that the edge of the car park will be bridged. August 2018: The bridge over the Midland Mainline was completed after some remedial work on the decking. Here in March 2019 electro-diesels 73952 & 73951 pass under the new bridge with a working from Derby RTC to Leicester and return. 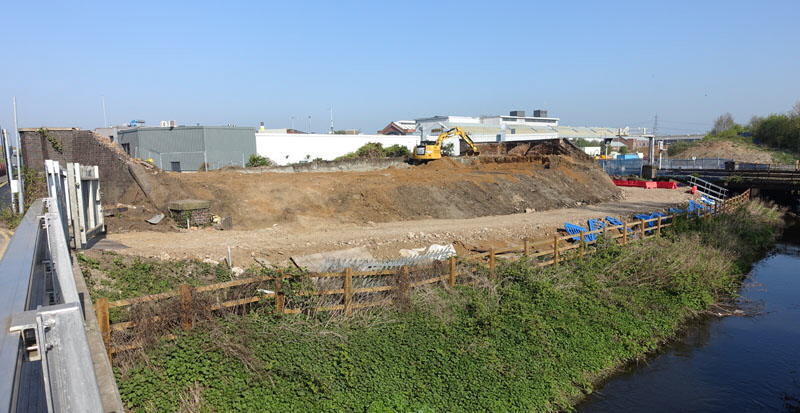 March 2019: Panoramic view of the bridge from Nottingham Road after the earth removed from the embankment to make room for the bridge to be installed had been replaced in its original position, which is actually out of alignment to the new bridge which is slightly south of the original site to in order to clear the Preci-Spark premises. Planning permission has been granted for the land in the foreground for “standby electricity generation and balancing facility, comprising gas utilisation engines, battery based storage unit, security fencing, gates, substation, transformers, control cabinet, LV switch room, CCTV, welfare and storage containers and ancillary infrastructure”. September 2018. View looking north from Alsopp’s Lane bridge with the new, green, bridge in the distance and the old brick Nottingham Road bridge behind it. Passing the chord up to GCR(N) and Ruddington is 66162 with a Peak Forest to Peterborough train of limestone. When the gap is completely bridged, this chord will allow trains from the national network to reach the greater GCR and then travel the full length from Ruddington to Leicester North. 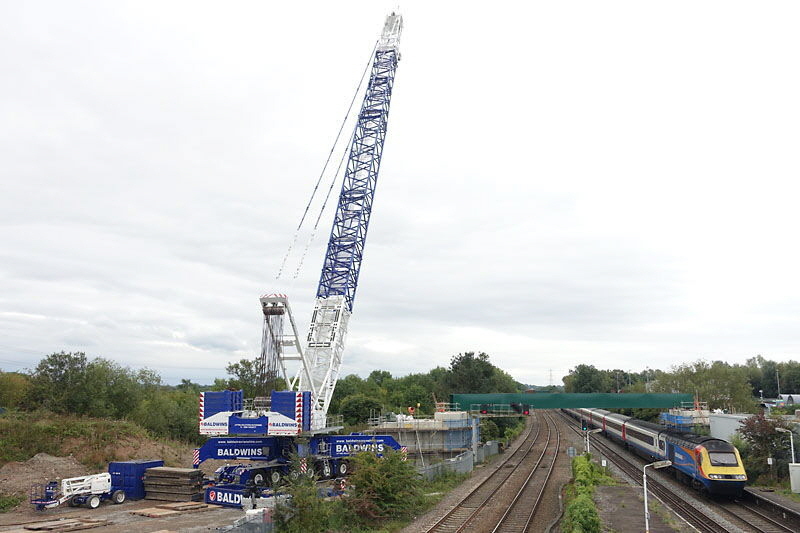 For more information about the erection of the bridge over the Midland Main Line visit the Great Central Railway site at http://www.gcrailway.co.uk/unify/bttf.php. 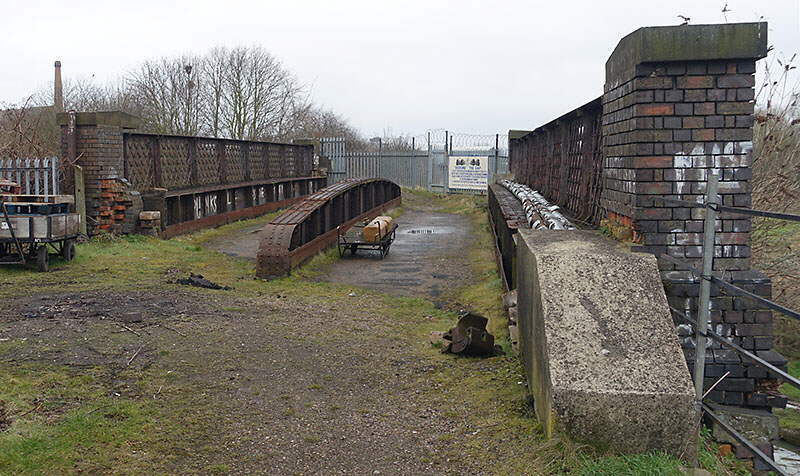 There are some photographs of the original bridge over the Midland Main Line in the Old Photographs section of this site. 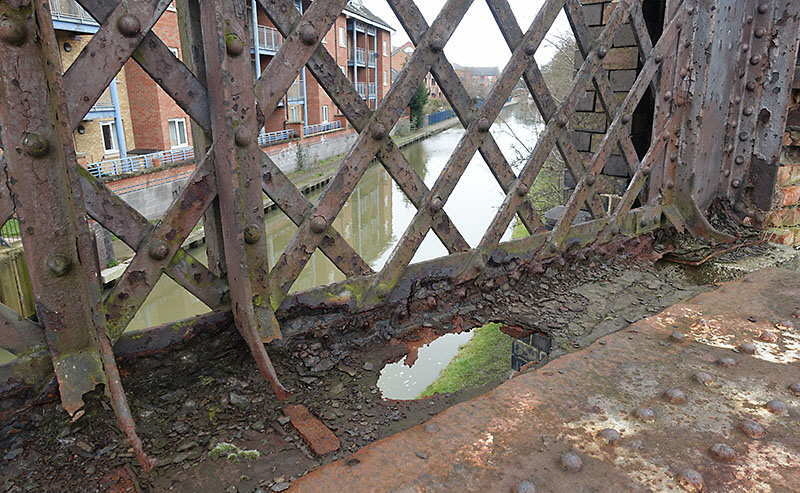 The original GCR bridge over the Grand Union Canal in Loughborough was never removed after closure of the line and remains in place approximately 120 years after it was constructed. Detailed examination of the bridge has shown that it is substantially sound though some reconditioning is required due to corrosion after all this time. A target of �475,000 has been set to start on the work, and if the money can be raised then it is planned that the work will be carried out when traffic on the canal is very light over the winter of 2018/2019. For more information visit the Great Central Railway site at http://www.gcrailway.co.uk/unify/. March 2018. The GCR bridge over the Grand Union Canal, looking west. March 2018. 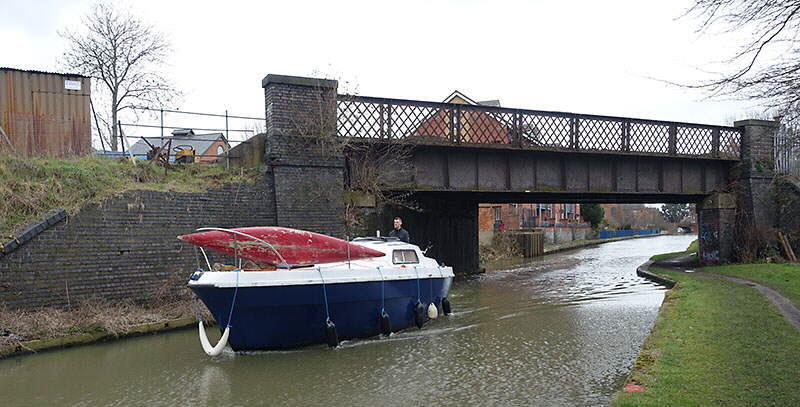 The GCR bridge over the Grand Union Canal, looking north towards ‘The Gap’. Laying over the right side of the bridge are corroded tubes which carried fibre optic cables as part of a national network—these have now been disconnected. March 2018. 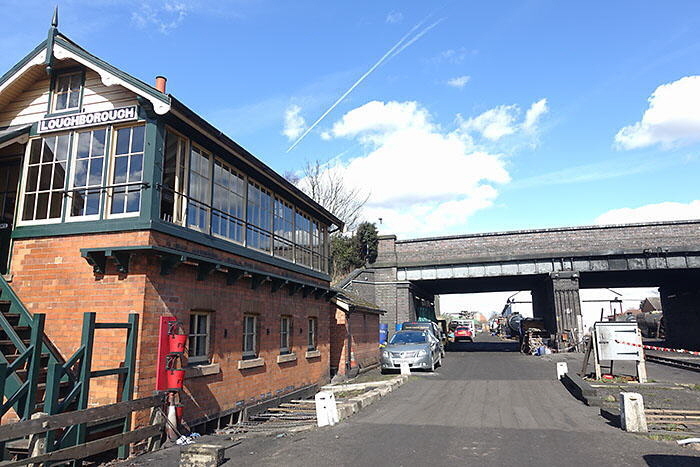 The GCR bridge over the Grand Union Canal, looking south towards the locomotive shed (with pointed roof) and Loughborough station. The locomotive shed occupies the original trackbed, and it is proposed (see below) that a new shed is built to the right to provide space for relaying the track. March 2018. The bridge is substantially sound, but has some corrosion which will need to be fixed. 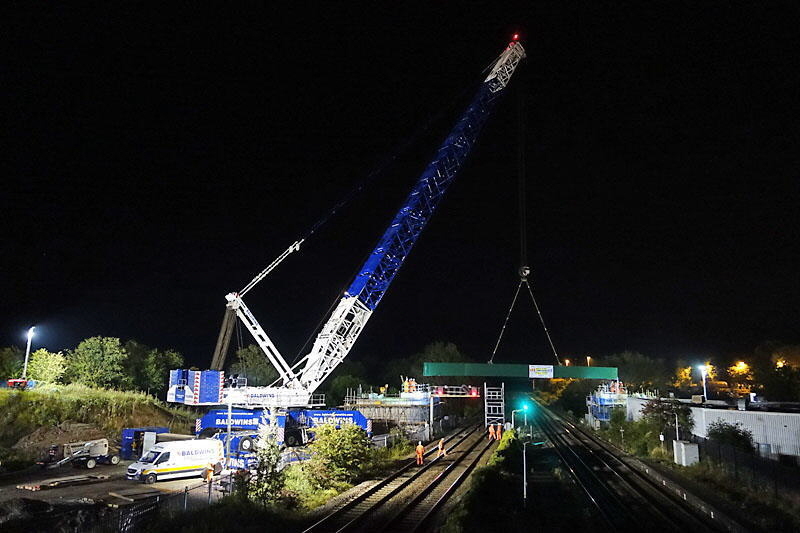 The work has been assessed as possible without having to crane the bridge out. December 2018: The lattice parapets of the bridge over the canal have been removed by crane for transport to a specialist company for refurbishment. 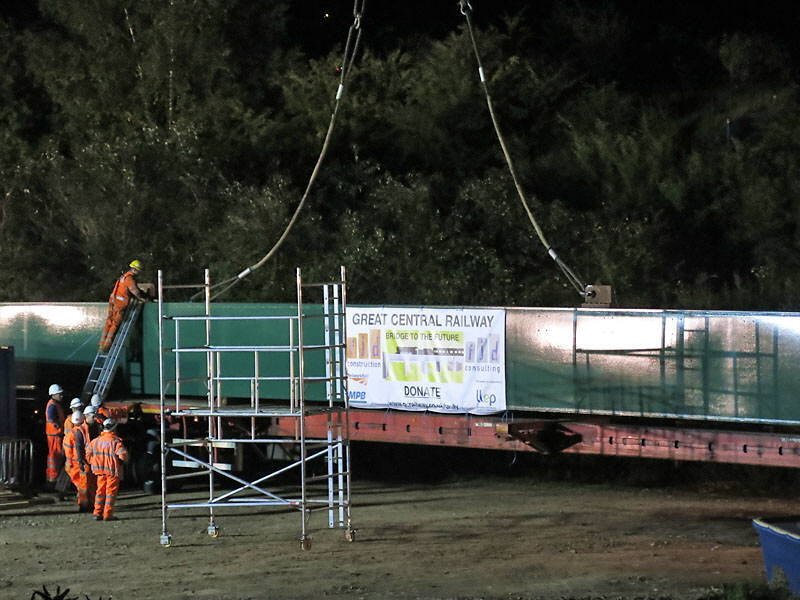 Click here for details and photographs of the operation on the GCR website. 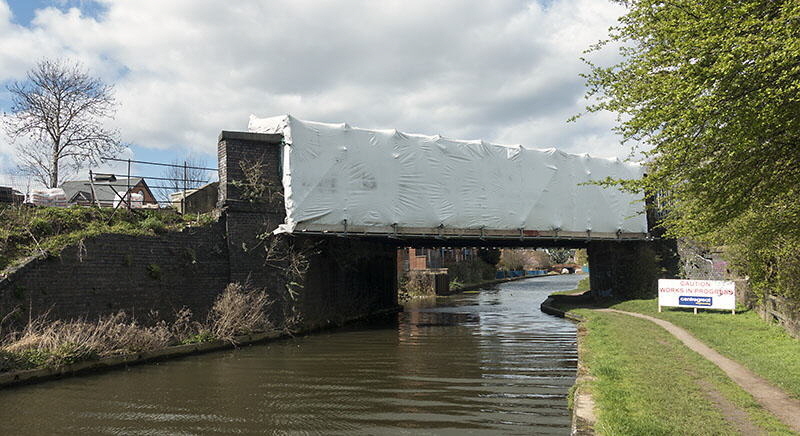 March 2019: The top of the bridge has been encased in a cocoon over scaffolding to allow refurbishing work to continue without contaminating the canal and environment. Click here for details and photographs on the GCR website. To get the railway across Railway Terrace, and possibly the Preci-Spark car park, it is proposed to reuse railway bridges removed by Network Rail during remodelling work at Reading. March 2018. The new bridge over the Midland Main Line is just beyond the old abutment of the GCR at Railway Terrace. Another bridge is required across the road here which leads to the Recycling & Houshold Waste Site. March 2018. 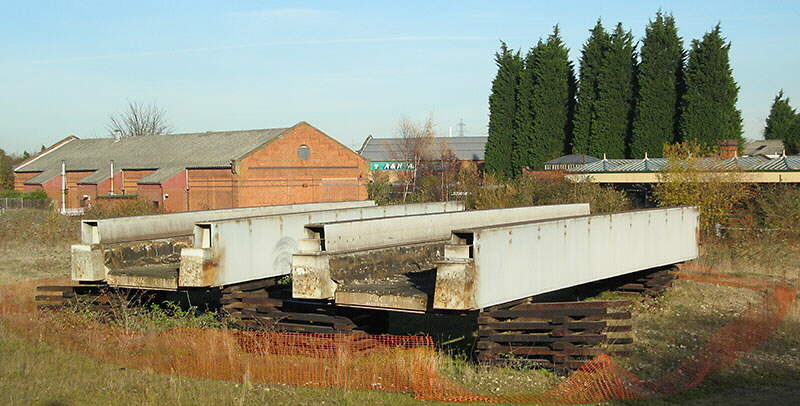 Panoramic photograph at Railway Terrace where the abutment in the photograph above can be seen in the centre and the new bridge over the Midland Main Line can be seen on the right. Bridges and short viaducts are required to span the road and the Preci-Spark car park, as shown in the model below. Section of the model of ‘Bridging the Gap’ displayed at the GCR showing the proposed bridges and viaducts at Railway Terrace, corresponding to the panorama above. December 2013. Bridges removed from Reading during a Network Rail upgrade which are proposed to be used to bridge Railway Terrace, and possibly the Preci-Spark car park. 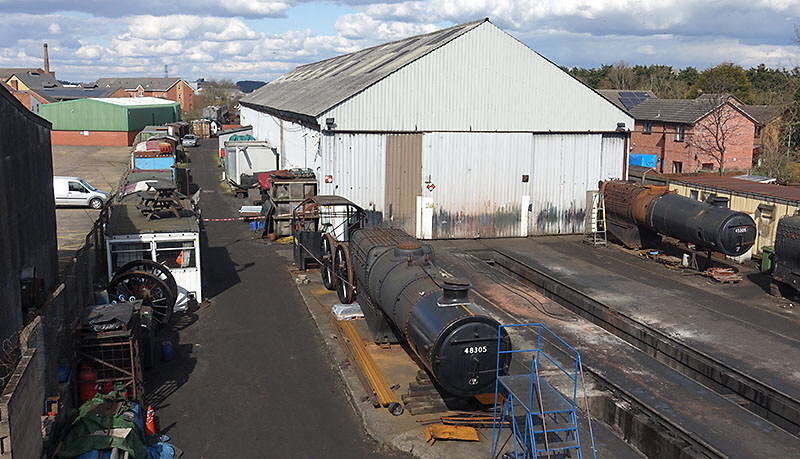 Here they are shown temporarily stored on the 3M site next to the GCR Loughborough station, before being moved to storage elsewhere since this site is being redeveloped. 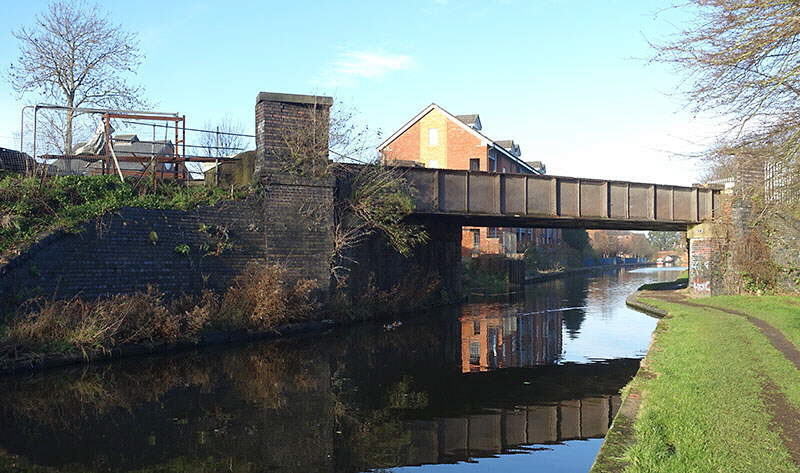 British Rail removed the railway embankment from north of the canal bridge to Railway Terrace in the 1980s and used the material to build the chord from the GCR(N) to the Midland Main Line before the bridge over the main line was removed (see the Old Photographs Section). March 2018. The site of the missing embankment looking south from Railway Terrace. One of the Preci-Spark buildings is on the left and the apex of the roof of the GCR locomotive shed can just be made out to the left of centre. September 2017. The site of the missing embankment looking north from the bridge over the canal. 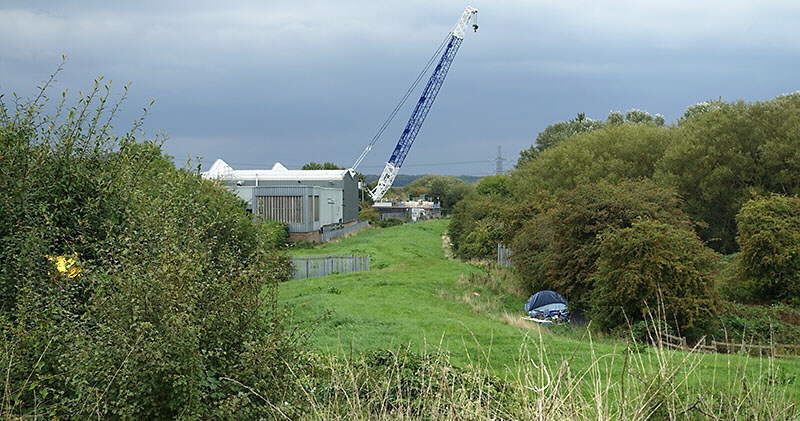 The crane in the distance was ready to lift the new bridge over the Midland Main Line into position. When all of the work of rebuilding bridges and the embankment is completed there will still be a large amount of work required in laying track and signalling. Here, in April 2017, 8F No. 8274 pauses at the furthest south that trains from the GCR(N) at Ruddington can reach on the north side of ‘The Gap’ during scheduled operation. This is the bridge over Nottingham Road, with the entrance to the Brush works on the left and ‘The Gap’ on the right. The locomotive has stopped just short of the top of the chord down to the Midland Main Line and the Network Rail track circuit, and will soon propel the train back to Ruddington. Looking south along the track bed of the Great Central Railway at the northern end of ‘The Gap’, just north of its crossing of the Midland Main Line. Photograph taken from the ‘Ruddington Requiem’ rail tour in June 1984 as it returned from Ruddington and started to traverse the chord from the top of the embankment down to the Midland Main Line . Track will be required along here together with a new junction with the chord and appropriate signalling linked to the Network Rail system. March 2018. Looking south across the canal bridge towards the station and the back of Loughborough locomotive shed, with its pointed end wall visible in the centre. The locomotive shed occupies the original trackbed, and it is proposed (see below) that a new shed is built to the right to provide a straight route for the relaid track. March 2018. Looking north from Empress Road bridge showing the locomotive shed, a former aircraft hanger brought here in bits and assembled in the mid-1970s. ‘Main Line’ (the magazine of the Friends of the Great Central Main Line) of Summer 2018 explained: “... the plan is not to refurbish the old building, which would be very expensive and pointless given its age and condition but to construct a brand-new steel framed building of a similar size. ... the new building would be on the left of our property and of approximately the same size as the current building but of a much higher standard. Not only would this allow a proper engineering and maintenance facility (potentially even with an interior crane) to be constructed, it would release the original GCR formation [under the current building] for through running to the north”. March 2018. The new track across ‘The Gap’ will have to run ahead through the right opening of Empress Road bridge and pass over the site of the old locomotive shed, seen in the middle distance. 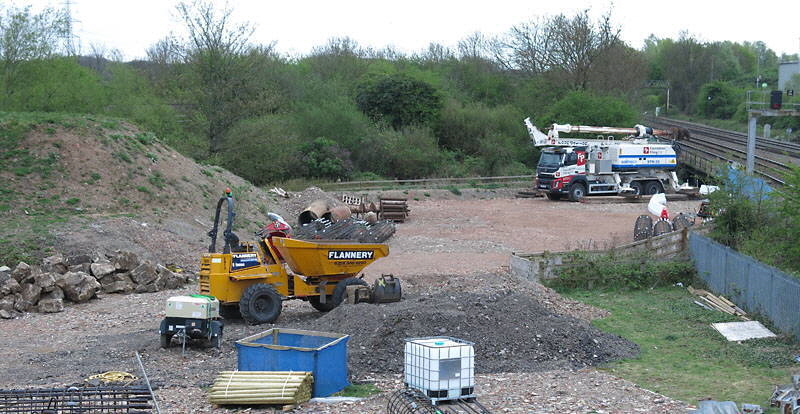 The signalling system of the GCR will have to be linked to GCR(N), across the gap, which is already connected to the Network Rail system to allow Gypsum trains from the Midland Main Line to reach the Hotchley Hill Gypsum works via the 1980s chord. 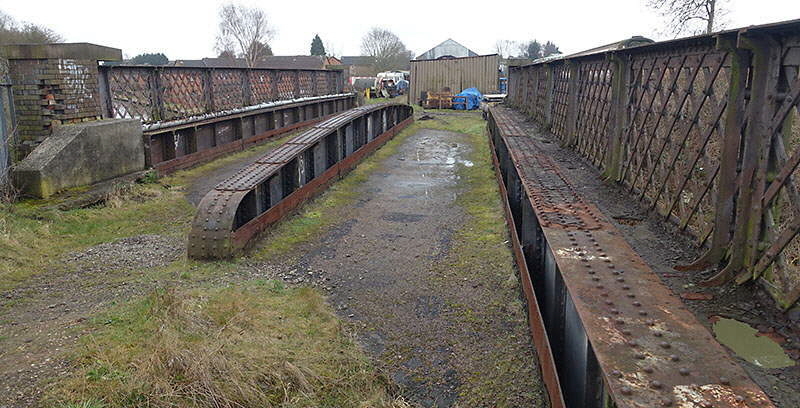 For more information about ‘Bridging the Gap’ visit the Great Central Railway site at http://www.gcrailway.co.uk/unify/.